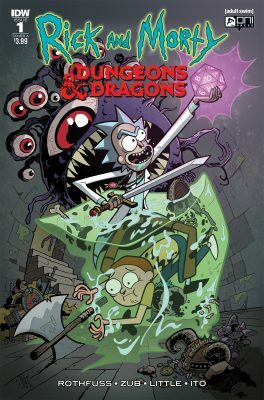 Reviews Rick And Morty Vs. Dungeons & Dragons #1: Roll It! 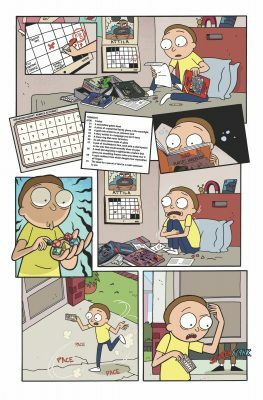 Rick And Morty Vs. Dungeons & Dragons #1: Roll It! You have entered Alpha comics and are now staring at the heavily populated new comics wall. If you wish to search the wall for the perfect comic, roll a perception check. If you’ve rolled above 10 you have quickly noticed Rick And Morty Vs. Dungeons & Dragons. With elated excitement you reach for this wondrous treasure only to find that a scaly monstrous hand has reached for the very same issue! What do you do?! What do you do?! With the proper plan and a high roll you may get out of this alive, and possibly with you comic intact. Just please whatever you do do not roll a natural 1! If you understood any of that first paragraph then this book is for you, and if you like Rick and Morty than this book is REALLY for you. There comes a time when all great franchises must collide and more often than not the result is entertaining or sometimes downright epic (like Scooby-Doo meets the Harlem Globetrotters). This just may be one of those times. Morty has once again found himself in a social dilemma. He has roughly three days to learn everything there is about D&D (a game he has never played), in order to impress a cute girl (who thinks he’s an experienced player) and possibly get laid. Luckily for him he has a crazy, alcoholic, mad scientist grandpa to turn to. I know you’re thinking that going to Rick is a bad idea, but there’s no way getting help from him will end in a dangerous, life threatening, mildly scaring misadventure. Right? This is a great book for fans of Rick and Morty, Dungeons & Dragons, or both. It has all the wit and humor of the Rick and Morty TV series as well as tons of D&D inspired jokes and gags. Patrick Rothfuss (The Name of the Wind) and Jim Zub (Wayward) do a great job combining the two properties and making the story accessible to fans from either side. The art by Troy Little (Powerpuff Girls) looks exactly like the art from the cartoon, so fans of the show should be more than satisfied. Fans of D&D and R&M will gobble this book up, but even those unfamiliar with these properties will be able to stomach it. It’s a fun story with tons of laughs and an engaging plot to boot. This book also leaves its readers with a crazy cliffhanger that’ll no doubt guarantee their return. If you’re looking for a change from your average comic this is a good detour down a path that is easy to find.